Recent studies warn that poor oral health can put you at an increased risk of developing diabetes, Studies show a relationship between the number of missing teeth and glucose intolerance. People with poorly controlled diabetes have a greater risk of developing dental problems like gum disease and decaying teeth. Dental exams may be good tool for diagnosing risks for developing diabetes. Diabetes is a chronic condition that results from high blood glucose, or too much sugar in the blood. By 2050, one-third of Americans are expected to be affected by diabetes. Periodontal, or gum disease, and dental decay have been suggested to be linked with diabetes as far back as the 1930s. 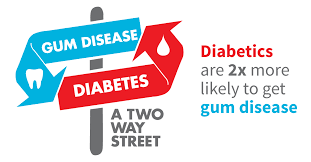 Your dentist is in a good position to find patients who have or are at risk of developing diabetes since most people usually see their dentist or dental hygienist more frequently than they see their doctor. And chances are, your dentist and dental hygienist will stress the importance of thorough daily gum stimulation and plaque removal. The plaque buster is a great tool to improve your oral health, and prevent gum infection. A 2011 study published in the Journal of Dental Research found dentists detected 73 percent of cases of diabetes by giving a periodontal exam - checking for missing teeth and the severity of pockets between gums and teeth. According to the American Diabetes Association, people with diabetes have an increased risk for developing gum disease because they are more susceptible to bacterial infection. · Other symptoms or complaints may include thirst, urinating frequently, constant fatigue, weight loss (Type 1), blurred vision, and uncontrolled infections even within the mouth (poorly controlled Type 2 diabetics). · A diabetes HbA1c (Hemoglobin A1c) test can now be done right in the dental office. A test showing a result of 5.7 or greater indicates a 92% chance the patient is metabolically challenged. At this point, the patient should be referred to their physician. 90% of pre-diabetics are unaware of their condition. 25% of type II diabetics are unaware they have the disease. The Plaque Buster was created by Penny K., a brilliant entrepreneur. "What inspired me was how truly important it is to have a healthy mouth. If you're on medication or a heart patient, or a diabetic your doctors may ask for your dental records. Great for our deployed troops, and your children. The product doesn't set off any airport alarms. I took the dental pick to a whole new level. I also have a Plaque Buster for Dogs. It's important to remove plaque build up in your mouth. My product is earthy friendly and doesn't harm our planet when discarded."